APPLICATIONS: Sonneborn NP 1 Polyurethane Sealant is a one-component high-performance gun-grade moisture-curing polyurethane sealant designed for a wide range of sealing and caulking applications in active exterior joints. With 800% elongation, 350 psi tensile and +/- 35% joint movement capability, NP-1 handles most every exterior application up to 1-1/2" wide. NP-1™ requires no mixing and typically bonds to many materials without a primer, including concrete and masonry. NP1 dries with a smooth finish and is paintable. Albion #DL-45-05 Sausage-pack Caulking Gun, All Metal Delux Line, Fits 10 Or 20 Oz Sausage Packs (1.5 Pint), Poly Piston, 12:1 Drive. Includes three 235-3 Plastic Cone Nozzles. Price/Each. ALBION # DL-45-T14P SPECIAL DELUXE 700-Lb. HIGH-THRUST SAUSAGE-PACK CAULK GUN, 18:1 DRIVE. HOLDS 10 or 20 OZ. SAUSAGE PACKS. STEEL BARREL WITH Teflon® COATED PISTON. PRICE/EACH. 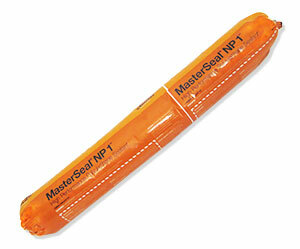 Masterseal NP 150 (formerly Sonolastic 150 VLM), ALUMINUM GRAY Color, Very Low Modulus / High Movement Capable Sealant. 300 ml Tube. Price/Tube. The Newborn Brothers 224, Convertable 24 oz. Bulk or Sausage Caulking Gun, 7:1 Thrust. Includes Accessories. Uses 10 - 20 oz Sausages or 24 oz bulk load. Price/Each. Newborn Brothers 232, Convertable 32 oz. Bulk or 10-to-30 oz Sausage Caulking Gun, 7:1 Thrust. Includes Accessories. Price/Each. Newborn 620-AL 20 oz. Sausage Caulking Gun, 18:1 Thrust, with Accessories. Price/Each. Newborn 624-GTS Bulk / Sausage Combo Convertable Caulking Gun. Handles either 24 oz bulk or 10 to 20 oz sausage. Adjustable 7:1 or 14:1 Thrust Ratio, Oval Nozzle, 3-Cones, Ring Cap, other parts included. Price/Each. 14 Inch Cushioned Handled PipeKnife, Steel caulking / Sealant Cutout Knife. Price/Each.